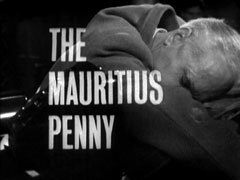 Paul Goodchild (Philip Guard) breaks into his employer's philatelic shop at night and is rifling through the post when he hears the owner, Percy Peckham (Harry Shacklock), telling Lord Matterley over the 'phone that a "Mauritius penny red 1847 and inscribed 'Post Office'" has been listed for sale. Goodchild enters and astounds Peckham by hanging up the 'phone and producing a gun; he shoots him and takes the list of sale. The next day, Steed plays Cathy a tape of Peckham's 'phone call and she tells him the stamp is extremely rare. He says they were watching Peckham because an agent was killed in Rome three months ago, bearing an envelope addressed to him. 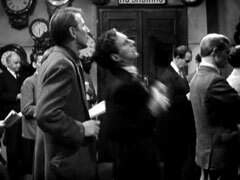 Goodchild hurries a schoolboy (Anthony Rogers) out of the shop when Gerald Shelley (David Langton) arrives. He's reprimands for killing Peckham and explains that the postman gave Peckham the mail in the street so he'd seen the list - they only have to maintain cover for another four days before their movement takes control of the country, anyway. Shelley worries about who may come looking for Peckham in the meantime and sure enough, Steed arrives, wearing thick spectacles and bluffing his way through the stamps, making a few errors. 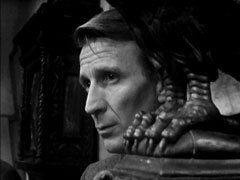 He claims he was recommended to them by Lord Matterley and startles Goodchild by asking if he could meet Mr Peckham. 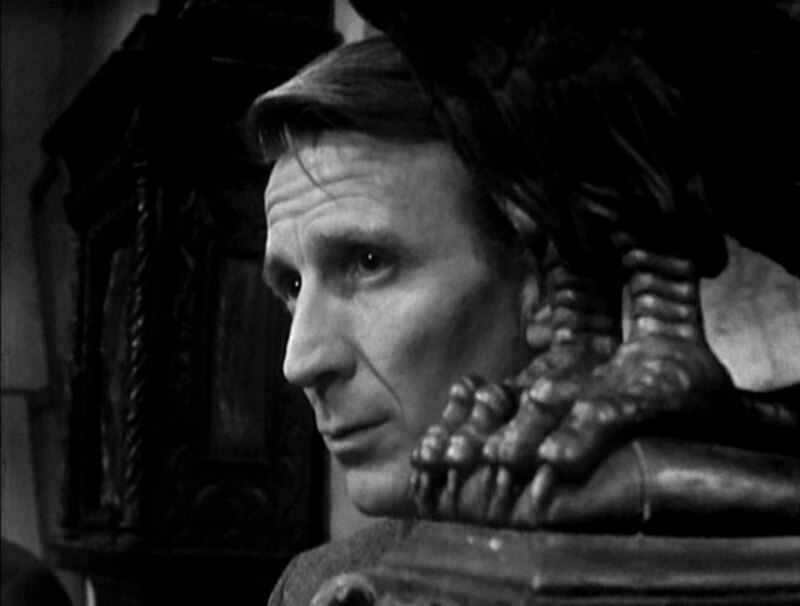 He peers in the back room, Shelley hiding behind the door, while Goodchild finds some Empires. Goodchild tests him by mentioning a false stamp and suggests he try the auctions. Steed notices the 'assistant wanted' sign on the door and is told Peckham is on holidays for a fortnight. Shelley is furious with Goodchild for using a trick question, and starts unpacking a crate of tommy guns, telling him they're going back. 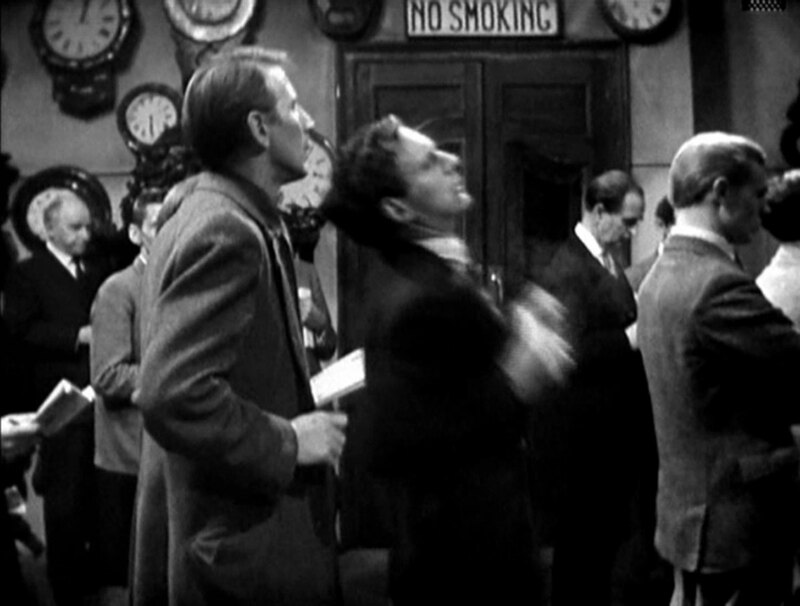 Shelley meets Brown (Alfred Burke) at the auction, telling him his target will arrive shortly. Moments later Steed arrives, just in time to see Lord Matterley (Richard Vernon) dramatically overbid to win a lot being auctioned by Maitland (Edward Jewesbury). Cathy arrives and, waving to Steed, accidentally buys a lot for £50. Steed graciously covers her bill, handing a cheque to the porter (Raymond Hodge) after Matterley guarantees his cheque. Steed chats to his lordship afterwards and mentions Peckham going on holidays - Matterley is surprised, saying he spoke to him last night but was cut off. Steed returns to Cathy, telling her about the tuppenny blue and Matterley's disingenuousness, then draws her aside when he sees Goodchild enter. Shelley checks the delivery book for Cathy's purchase then summons Brown, who pushes past Steed to reach Goodchild, and puts a gun to his back. Goodchild refuses to leave the room, so Brown shoots him when the fall of the auctioneer's gavel masks the shot. Steed goes to check and finds him dead. Next day, he reads that the police are most puzzled by who picked his pockets after he died, and Cathy is sorting through their contents. She finds a stamp list but notes that the stamps are all of little value and would never appear on such a list and Steed deduces it's a substitution code based on a catalogue. He finds an appointment in Goodchild's diary at 3pm and plans to keep it in his stead after convincing Cathy to take the assistant's position at Peckham's. Before he can leave, Inspector Burke (Alan Rolfe) and Sgt Andrews (Edward Higgins) arrive to interview him about Goodchild's death and search his flat. He chats with the policeman while Burke searches but notices he's not wearing regulation boots and attacks him. He turn on Burke and wrestles him to the ground but Andrews recovers and clobbers him with his truncheon. Mrs Gale arrives at the shop where Brown is deciphering a list and enquires after the job advertised while Steed comes to, Freckles licking his hand and his char lady, Elsie (Grace Arnold), buzzing around him with a vacuum cleaner. She tells him she had quite a time cleaning up his flat while he slept - drawers pulled out, suit all in a heap. He checks the desk and finds his revolver missing and rushes out, Elsie handing him his coat. At the shop, Mrs Gale is sorting stock when she hears Brown on the phone. He tells the caller he's hired the girl from the auction as an assistant and is told to kill her. Brown agrees and says he's received final instructions from Paris: Norway and Denmark will move at the same time they do and he relates the coded instructions. Lord Matterley arrives at the shop, surprised to find Cathy there and more surprised that Brown is in charge. Cathy fetches Brown and finds him nailing a crate shut in the storeroom. 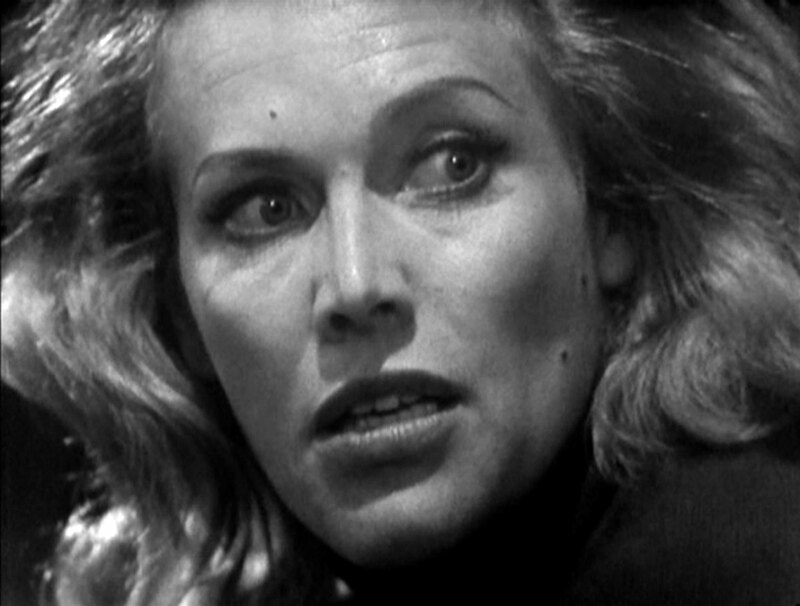 She offers to clean up in there while he assists Matterley, who is after some early Americans, then opens the crate and discovers Peckham's body inside. She tries to hammer it shut again with her shoe, pausing when she hears the schoolboy return to the shop, whereupon Matterley leaves. A lorry driver (Edwin Brown) arrives to take the crate to the auction rooms and fastens it with his crowbar, then goes for his mate when he discovers how heavy it is. Brown bursts in, finding Cathy looking at the list and says they can stop pretending, then menaces her with the crowbar, keeping her silent while the driver and his mate (Anthony Blackshaw) remove the crate. Brown starts interrogating Cathy but is interrupted by the driver returning for his bar. He leaves and Cathy makes a break for it and fights Brown, knocking him out with a karate chop. She finds an invitation to a philatelic convention at the Grosvenor rooms in his pocket. Steed arrives to keep the appointment, telling Miss Power (Delia Corrie) he's Goodchild. He's shown in to see Sheila Gray (Sylvia Langova), a dentist. She checks his teeth and Miss Power realises he's not Goodchild as he doesn't match the dental records. Sheila prepares a needle, saying they'll fix a cavity, and Miss Power 'reminds' her she was supposed to call the hospital at 3pm, raising Steed's suspicions. She calls Shelley who tells her to keep him there until he arrives. In the surgery, Steed has been discovering totalitarian tendencies in Miss Power's politics. Miss Gray menaces him with a high speed drill and tells him they know he's an impostor, then knock him out with novocaine. Steed comes to some time later, groggy from the gas, and finds himself tied to the chair with Shelley gloating over him. Shelley indicates a crate awaiting him then proceeds to interrogate him, he's on the point of pulling teeth to extract information when the lorry driver arrives and knocks Shelley out. He unties Steed and says, "If I were you guv', I'd change my dentist". Brown arrives at the convention but Andrews won't admit him and goes to fetch Major Gray to see if he should be allowed in. 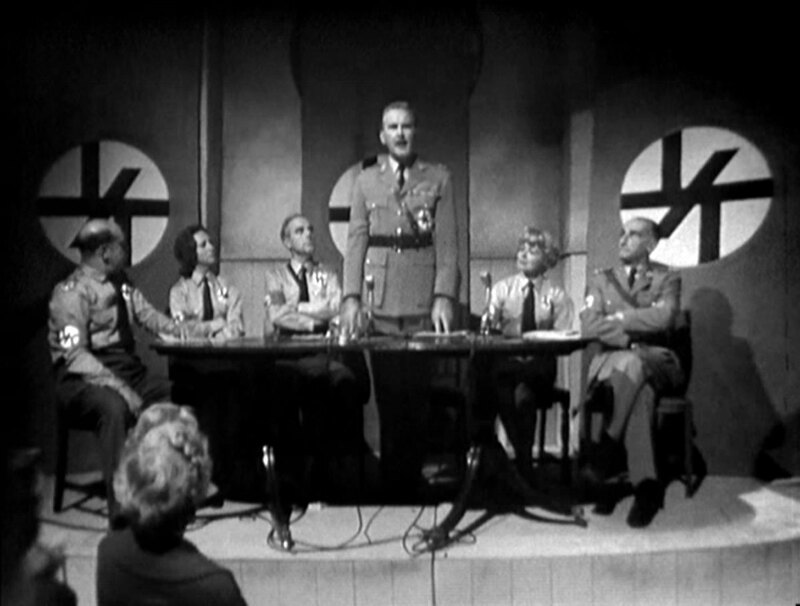 At that moment, she's letting the driver and his mate in with the crate, and Maitland is introducing a foreign delegate (Theodore Wilhelm) who will inform them of progress in Scandinavia. Brown is finally let in and goes with Burke, who's wearing a colonel's uniform, to see Miss Gray. He spots Cathy on the way and tells Miss Gray all about it. At the conclusion of the delegate's speech, Cathy is unmasked as a traitor to the New Britain and dragged off for questioning by Brown. Thrust into the interrogation room, she finds Brown unconscious on the floor and Steed sitting with his feet up on the desk. 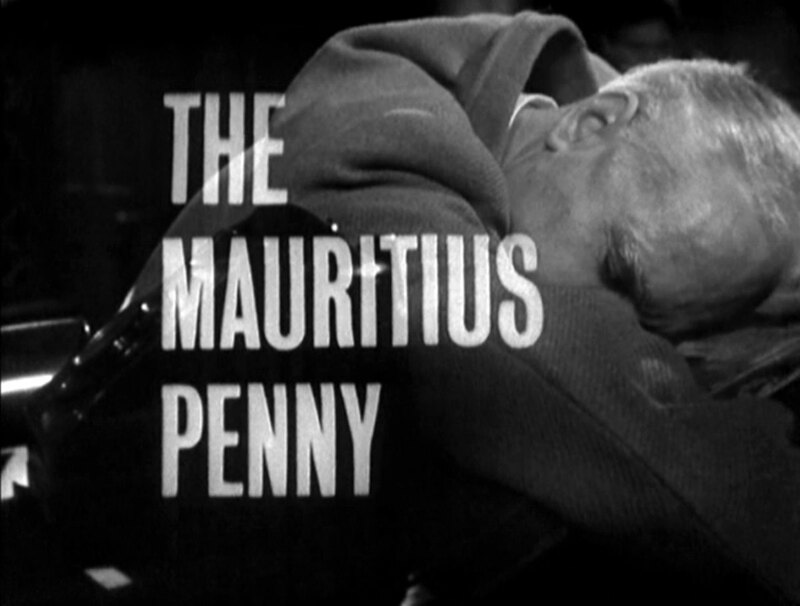 Their leader, only known as 'The Mauritius Penny' arrives and Miss Gray tells him the noise in the back room is Brown interrogating a spy. Inside the room, Steed is thumping a desk with a truncheon while he tells his boss the disposition of the fascists and their armaments. The leader enters and is revealed to be Lord Matterley who dismisses their attempt to stop his movement. He notices Brown recovering and stalls them until Brown reaches Cathy and she and Steed are overpowered. Matterley is announced to the convention and goes to address his supporters, leaving Brown on guard. As soon as he leaves, Brown is attacked and subdued. Matterley arrives and sadly announces the day of New Rule has been postponed - Cathy and Steed have submachineguns trained on the crowd and the dias. The next day, Steed and Cathy return to his flat where Elsie is vacuuming the upstairs hall. They find the packing crate of the albums Cathy bought awaiting them, and Cathy claims to have found a rare stamp in the first album she picks up... Steed leaps at a catalogue and discovers no such stamp exists, and she grins naughtily at him.